1. What is cyberbullying anyway? For the most part, cyberbullying is bullying, only it happens online or on phones or other connected devices. As for what bullying is, that depends on who you ask, but most experts agree that it involves repeated harassment and some type of power imbalance – and, when young people are involved, it usually has something to do with what's happening with peers at school. It’s important to remember that not every mean comment or unpleasant interaction rises to the level of bullying. Sometimes it's just what kids call "drama". We mention this because too many kinds of behaviour are called "cyberbullying", which can cause overreaction and inappropriate responses. 2. How likely is it that my child will be cyberbullied? Some studies say that only 4.5% of teens have ever been cyberbullied and others say the figure is as high as 24% (more on this below). Either way, too many students have experienced cyberbullying, but it's important to note that most have not, and most don't bully others. We point this out not to minimise a serious problem, but to emphasise that bullying is not a norm. Kindness, not cruelty, is the norm and, just as with other social problems, communicating the facts reinforces positive behaviour and actually reduces the problem. As for any one child, it depends so much on the person, his or her peer group and their context. A positive school culture can make a difference, especially for higher-risk populations, such as special-needs students or lesbian, gay, bisexual and transgender (LGBT) youths. For most kids, "online" is social – a shared experience – so no single individual has complete control over what happens in digital spaces. Research has found that a child's emotional makeup and home and school environments predict online risk better than any technology that he or she uses. Treating others (and oneself!) with respect and kindness can really help keep social media use positive. 3. How do I know if my child is being cyberbullied? others who have experienced it, if it's a problem at their school and what they would do if they were cyberbullied or knew about others who were. If they seem obsessed about checking text messages and social apps, it could be because they're worried about what's being said about them. It may not be bullying, but it may be a sign that your child needs a little extra support. The US government's StopBullying.gov website suggests that parents be on the lookout for signs such as difficulty sleeping, frequent nightmares, declining grades, not wanting to go to school, feelings of helplessness or decreased self-esteem. 4. What's the best way to keep cyberbullying out of my child's life? 5. What do I do if my child is cyberbullied? 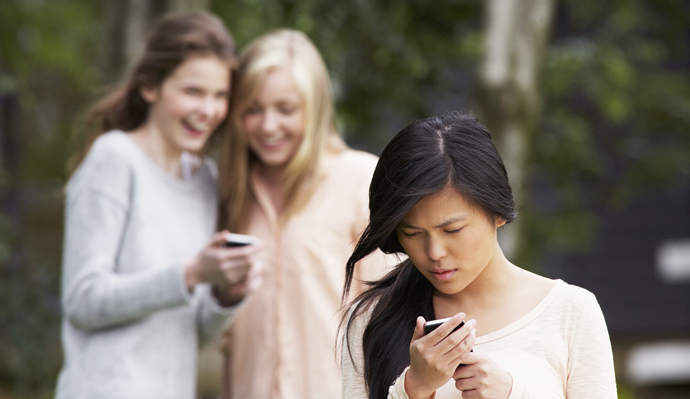 Cyberbullying cases are as individual as the people involved. So the general advice that's all over the web – not to react or retaliate, block the "bully", and print out and keep evidence in case it will be needed – can help in some cases. But the most important thing to do is talk to your kids about what's going on, help them think through what happened, how they feel about it and what they’re going to do about it. No one knows how to resolve a situation without understanding it fully. It's important to involve your child in the process, not just take over yourself, because the main goal is to help him or her strengthen the self-confidence that might have been shaken and to restore a sense of physical and/or emotional safety.